An HTPC (Home Theater PC) can be defined as a personal computer whose main objective is to be used as a core media device in a home theater. In this blog series I will attempt to address and explore building a home theater PC from scratch. In this scenario I am faced with many hardware and software choices that will ultimately decide the outcome of my HTPC. As we all know there are many of the shelf products that are advertised as an HTPC in a box from Boxee Box By D-Link to the Apple TV. While these products offer a ready made solution, they lack flexibility and the end user is bound to the native interface on these boxes. In many aspects they are another flavor of a networked DVD player or a cable set top box. On the other hand, when building an HTPC it can be easily fine tuned to the user needs and even used as a generic PC as well as an HTPC. What are the main distinctive elements of an HTPC versus a generic PC? Many considerations come into effect when building an HTPC. A list of these considerations is hardware price, case size, power consumption and audible noise, video and audio quality, latest media player, ease of access and integration with the home theater and multimedia software. Hardware Price: The magic equation here is performance vs price. We want to build a machine that is good enough to play good quality media without breaking the bank. We don't want to buy the latest and greatest hardware, we just want to buy the right hardware for this use case. Case size and looks: We would like to get the smallest form factor that will fit all the chosen hardware components. We want to avoid a big box that takes over the precious shelf space in the home entertainment. Also we would like a nice looking box that fits in with the other components. Power consumption and audible noise: The higher the power consumption, the louder the system is. High power consumption requires more efficient cooling to dissipate the heat as a result. More cooling requires fans to spin at a higher speed resulting in louder noise. Fan-less systems are highly desired. If we are not able to achieve a Fan-less system we would like only one fan with speed control. Video and Audio quality: The two most important hardware pieces that have an impact on video and audio are the CPU and the Video card. We don't want an overkill CPU nor an overkill Video card. At the same time we want a CPU and a video card that support the latest media standards such as the latest high definition video and audio outputs. Latest media Player: We would like to include a blu-ray player, possibly one that can play 3D. Ease of access and integration with the home theater: We would like this HTPC to integrate with our existing home theater. As an example integrate with the existing universal remote control to power on and off. An introduction of a mouse and keyboard will not break this rule as the majority of universal remote controls do not embed a mouse or a keyboard. The Multimedia software: A computer without software is as good as a car without an engine. It will not take us anywhere. The bad news is that we have lots of software choices to make from the operating system to the software media controllers. The good news is that we can always change our mind and install a different software. That is the beauty of the HTPC, we are not at the mercy of a single company and we have a better choice. Customization is very important and the software is selected based on the multimedia needs. Obviously we can't explore all scenarios but we should be able to walk through one or two possibilities. In Part II we will go through the hardware choices and the cons and pros of these choices. The title says it all. What is more to discuss? Just as a Newsweek's article points out a Brain Freeze when provided with many choices. Too much social media can cause a negative effect that outweighs the benefits. How to benefit of social media without being dragged down by it? Many business owners struggle with this concept. As an example, a small business owner involved in social media would require a full time employee sitting in front of a computer tweeting, facebooking, linkedIn updating and entertaining the masses. And please excuse my use of the new English verbs. What do the numbers show? Is there a real marketing study that can relate the social media to business income? Maybe there is such a thing and maybe not and if there is who is paying attention? The social media frenzy is more about image than substance. It can be summarized with one phrase "A la mode". Translated in English fashionable, cool, trendy. As a business owner you desperately need this label otherwise you are considered a yesterday's business and not viable for the future. Swimming in the sea of social media one has to have a strong endurance. Meaning having long term goals and aspirations as the rewards are not reaped immediately. Frustrations aside, the most difficult step is starting and creating the accurate image of who you are and what you offer. It is all about marketing, isn't it? To make the story short and not to overload the reader, the answer is yes and no. Make your social media presence but do not allocate more than you can afford to it. Enjoy it and use it to your own advantage and do not be used by it. I have been researching for more than a month for a good digital to analog converter (DAC) to interface with my audio streaming player. This DAC will be the main decoder for my audio system which includes many components. After hours of reading reviews on different DACs I decided to go with the Benchmark DAC1 PRE. The main deciding factors were price vs performance and a comprehensive feature set in the DAC1 Pre. In addition to the digital to analog conversion I was looking for at least one analog input for my home theater front speakers coming from my Rotel RSP-1066. As a background I have a hybrid system where I separated my two channel audio system from the 5.1 home theater system. When I am listening to two channel music the Rotel RSP-1066 is off. When I am watching a movie the Rotel receiver is on including the front 2 channel speakers. 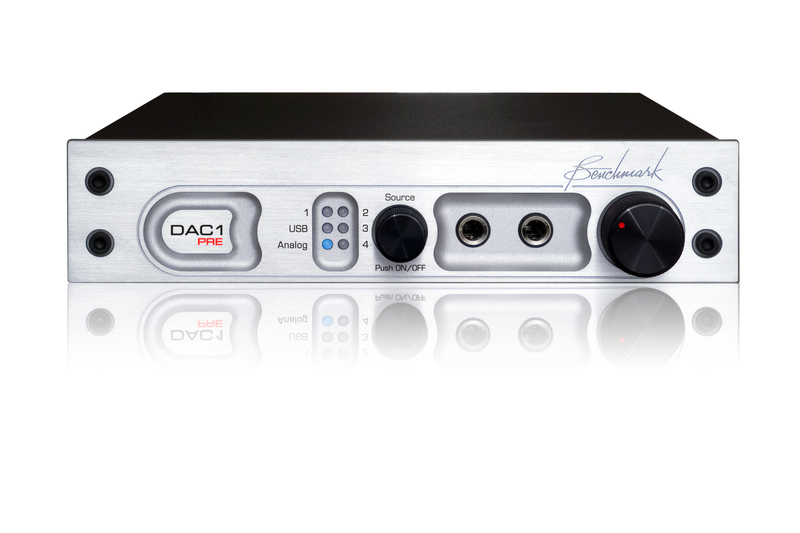 To make the story short the Benchmark DAC1 Pre had all that I needed plus extra features such as a headphone amplifier and a USB input. Logitech Squeezebox Touch (Audio Streaming) connected to DAC1 digital coax input. Bravo D1 DVD player (CD player transport) connected to DAC1 toslink input. Rotel RSP 1066 (Home theater front Channels) connected to DAC1 analog input. Rotel RB-1090 connected to DAC1 XLR balanced output. Any audio multi-components setup faces the ground loop hum nightmare. This is no different with my setup when connecting the Rotel Receiver to the DAC1. My Tannoy speakers were producing a very audible buzz from 10 feet away. A search for a ground loop isolator ended up with a trip to Radio Shack (The Source in Canada) and an rca ground loop isolator was put in place. Since the audio signal coming from the Rotel receiver is just for home theater and not for serious music listening, the rca ground loop isolator was good enough for my setup. The DAC1 comes with -20 db attenuator factory settings. At the default setting the DAC1 PRE did not exhibit a full dynamic range, at least not in my system. Somehow the music did not have a full body and I had an urge to turn the volume all the way up. I opened the DAC1 PRE and changed the Gain to 0db or neutral. The impact of this change is the high voltage output to my amp and the volume control is more restricted to a maximum of 12 oclock without having to blow my speakers or suffer a hearing loss. The sonic impact was much more noticeable and the DAC1 completely disappeared from my system. The only thing left noticeable was the shiny blue light. These settings were the ideal in my configuration, which might not be true to every system. The idea is to try different settings and find the best one for a given system. Another test that passed to my ears was the switching between the squeezebox and the cheap Bravo D1 player used as transport. The sound reproduction was identical in every aspect when changing the input between those two sources. For the price I paid for the DAC1 PRE I could not get a better deal. My system is sounding its best and is only limited by the source recording and my speakers accuracy in sound reproduction. 20/02: Media Streaming. Are we there yet? If you follow the news lately or listen to radio shows or audio broadcasts, or you have "connected" friends then you must have heard of streaming. Not necessarily the word streaming but jargon words that in essence all map to streaming. To name a few examples: follow us on twitter,listen to our podcasts at ...,rss feeds,youtube,internet radio etc... All these buzz words rely on streaming, without streaming they simply cannot exist. Internet is the backbone that streaming uses to carry the stream from point to point. Not to go into much technical details a simple analogy can be drawn between conventional radio broadcasts and streaming. As conventional radio broadcasts uses sound waves to carry the audio signal, streaming uses the internet infrastructure to carry the media data. As one realizes the internet streaming is not limited by distance nor by geography. Meaning anyone anywhere in the world having an unrestricted internet connection can stream media content anytime. Streaming technology is a revolution in itself and is being used to the fullest extent by many political movements in the world. To name a few examples, Iran, Egypt, USA during the 2008 presidential Election campaign. Media streaming draws its power from the almost immediate access to the large young audience and the inherent broadcasting capabilities. This is crucial for campaign organizing and for quickly mobilizing activitists on the ground. Aside from its political power, streaming plays a role in entertainment and in the business world. Youtube is a very good example of becoming the star maker in the entertainment world. Many virtually unkown artists became famous in very short period of time due to Youtube. As a consumer how to make the best use of streaming? Streaming can be used as a tool to get exactly what we need anytime of the day. A quick google query can retrieve the available streaming content that we desire to see or hear. Streaming can be used to learn and to teach. Streaming has made it possible to acquire very hard to get information in a click of a button. To grasp its power just compare it with a book research done at a library 10 years ago! In addition to massive information storage the internet has become the largest single source of information. The key to the streaming success is the virtual access to massive information without the geographical limitation, time limitation and at wire speed. Imagine the whole world is connected by a single highway mesh and traveling between two points is done at data speed. With streaming the possibilities are endless and limited only by our imagination. Welcome to the GuruTech blog. This blog is dedicated to sharing technology ideas and trends. The articles are kept short and address topics of general interest. The tech terminology of the articles is kept simple; so they can be easily read without having to look-up advanced terminology. Once an article is published anyone can comment on it. Also requests for new topics are welcome as long as the topic is of general nature.